The Coolock, Artane & District Historical Society has recently been founded and is planning various events for 2018. If anyone would like to sign up to receive e-mail updates on upcoming meetings and events, please do so here and we’ll be in touch! In 1951, shortly before Coolock was to be transformed by housing estates and was still a country village, we get this lovely description of a sheaf tossing event that was held at that year’s Coolock Fête. Sheaf tossing is a seasonal occupation at this time of year and in North County Dublin ‘Tossing the Sheaf’ is an old, still popular custom. I saw this for the first time last Sunday evening at Coolock Fête. The Wheat Sheaf, weighing over a stone, is tossed over a bar, which, after it reaches 16 feet is raised by a half-foot for each round of the contest. When the finals are tossed off on the last night of the Carnival week, only the champion tossers will remain in the field. Mr. Patrick Connor, who with Mr. Patrick Foran is in charge of the Sheaf-Tossing events at Coolock, assures me that the men of the fields think nothing of tossing over the bar at anything from 20 t0 25 feet. Mighty men are Messrs. Connor and Foran an indeed they would need to be, one of the duties of their stewardship being to catch the sheaf at the other side of the bar, tidy it up, and throw it back for the next toss. Taking a wallop from a stone of flying corn every two minutes for about three hours, is in itself a strenuous way of spending the evening. Irish Independent, Aug 31, 1951. This image from the Tinahely Agricultural Show which was held in Co. Wicklow only a fortnight ago gives an idea of how the set-up would have looked. Does anyone want to organise an event for the next Coolock Community Day? 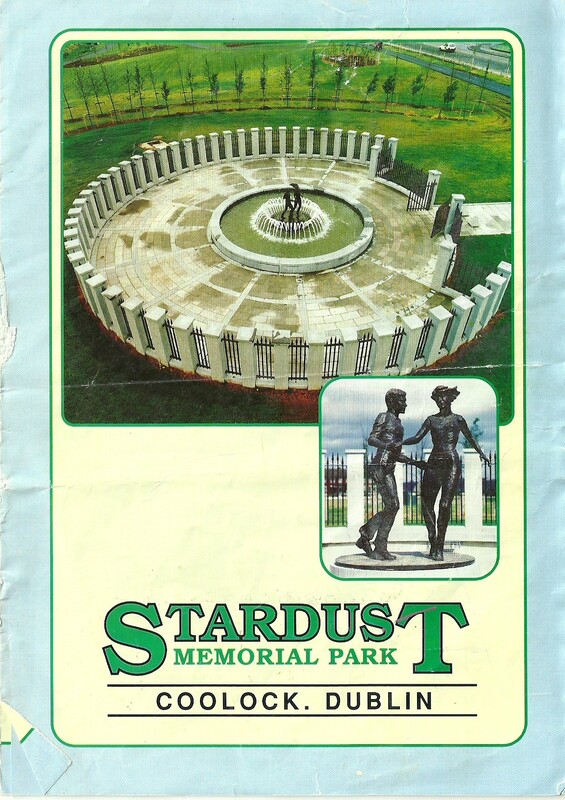 The Stardust Memorial Park was commissioned to commemorate the 48 people who lost their lives in the Stardust Nightclub fire of 14th February 1981. In 1991, on the 10th anniversary of the tragedy, the then Taoiseach, Charles Haughey and his son Seán Haughey, the then Deputy Lord Mayor, attended the sod turning ceremony. 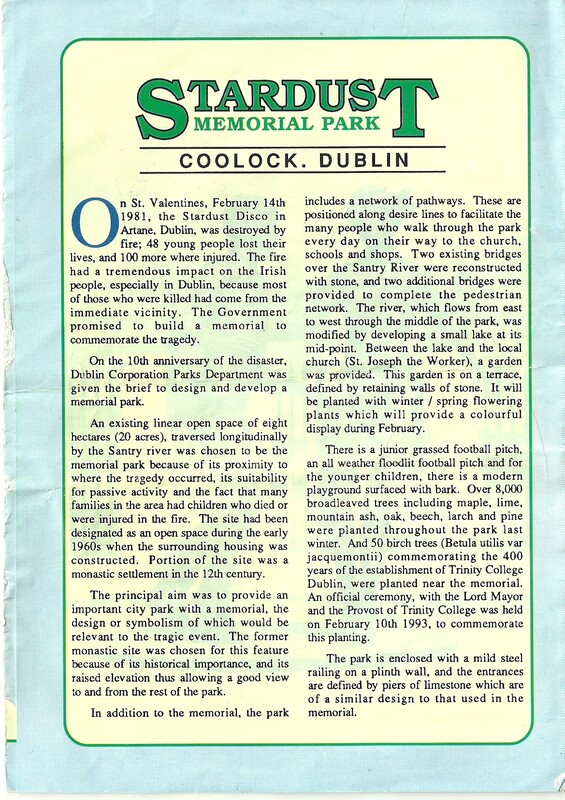 The park was officially opened on September 18th 1993 by the then Lord Mayor of Dublin, Cllr. Tomás MacGiolla. The cost of the park was in excess of £500,000 and included a playground, all-weather pitch, football pitch and a garden terrace with seating. New bridges were placed over the River Santry which runs directly through the park into a small lake in the middle. 8,000 trees, including maple, lime, mountain ash, oak, beech, larch and pine were planted. Additionally, 50 birch trees commemorating 400 years of Trinity College were planted around the main fountain. A sculpture in the centre of the fountain depicts two young people dancing and the fountain is enclosed by 48 pillars, each symbolising a person lost in the tragedy. Interestingly, the leaflet suggests that a portion of the site was a monastic settlement in the 12th century. 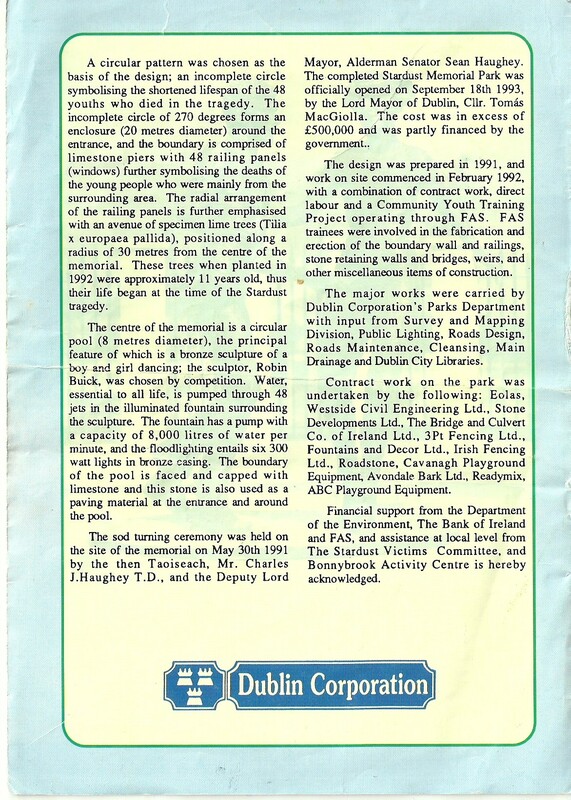 My mum kept this leaflet safe in a copy of Douglas Appleyard’s Green Fields Gone Forever, a great book about the history of the Coolock Area. As you can see from this recent satellite image of the park, it remains largely unchanged today.